Ready for some fun? Splash pads and water park features are a great way to add fun filled excitement to any project. We build for educational facilities, amusement parks, apartment complexes and even single family residences. They are a terrific way to add countless hours of safe fun for people of all ages. Small or large, we can design and build splash pads to accommodate areas of any size. Water park features such as water slides, lazy rivers, interactive water features, wave pools, and multi-level water play structures all add another level of excitement to any type of property. 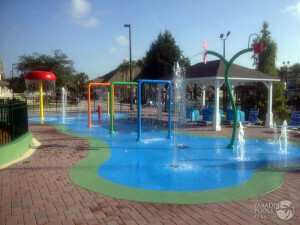 Let us add some fun and increase revenue by adding splash pads and water park features to your project.